KATHMANDU, March 20: The federal government is now mulling to stop fiscal transfers to local levels in lump sum in the next fiscal year to cope with the crunch of spendable amount in the government treasury. The government has faced crisis of spendable cash in its treasury since the first installment of the fiscal transfer to local levels on the first day of the current fiscal year. The strategy that the new government has floated for the next fiscal year will be a change in budget transfers, which is part of efforts to embrace federalism after last year’s local elections. The government this year released a total of Rs 225 billion in three installments. The last of such budget transfers was on March 15, but the local levels have hardly spent a third of the budget according to a recent estimate of federal government. The reporting of the spending is not yet in place. The government was on a budget deficit of Rs 35 billion by the end of six months or mid January of the current fiscal year while it has already borrowed Rs 114.79 billion out of the target Rs 145 billion announced in the budget. 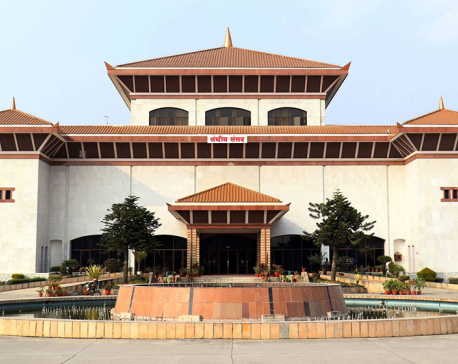 “We have now advised the government to release budget as prescribed by Natural Resource and Fiscal Commission, based on the progresses made in spending by local levels to cope with rising budget deficit,” said Nirmal Hari Adhikari, chief of the budget division of Ministry of Finance. Unlike in the recent past history, government started borrowing from the internal market from the very first month (mid July to mid August) of the fiscal year. It has so far borrowed up to Rs 115 billion. In its mid-term review report of the budget last week, minister for finance Yuba Raj Khatiwada has announced to mop up all the targeted amounts by the end of fiscal year. Government will have to endorse this new arrangement of budget release in new financial appropriation bill in the new budget for the next fiscal year. Talking over telephone, Siyaram Kushabaha from Katahariya Municipality of Rautahat district, said that his municipality has already spent a little over 50 percent of the budget of Rs 389 million. The municipality had got Rs 270 million as grants from federal government. Kushabaha said government’s plan to distribute resources based on progress of spending is good and it encourages the municipalities that are smart in implementing projects. Critics are however not happy with these plans of new arrangements of the budget transfer. Expert of fiscal federalism Khim Lal Devkota said that the federal government is trying to kill basic principles of fiscal transfer to the local levels which should be free of any conditions. “This new plan is against the principle of constitution which says the state power is to be distributed to the sub-national governments,” added Devkota.